His face was scarred, the flesh of his forehead, cheeks and chin ravaged with the lesions of time and self-indulgence. His torso was round and, from where I watched, shrunken, as though it had compressed in upon itself. He might have been slim once, youthful and full of honest conviction, and that would have given him the stature of a giant on the stages on which he’d acted. But he’d grown rotund, and he held his oversized head atop his soft body with the care of someone aware of his infirmities, a giant reduced to the proportions of an ordinary man. It was the nation’s birthday, and the town square was full of revelers. I’d been taking my morning dose of caffeine from a street-side bistro, and I’d noticed him sitting beneath a large cottonwood, in the strip of grass between the sidewalk and Main Street. The pedestrians who strolled past him turned up their faces in expressions of disdain, whether with him or the words he’d written on the piece of white poster board laid out on the grass in front of him. I’d known him once, I realized, or someone very much like him. His long hair, was brushed back from the crown of his head over his shoulders, white now, no longer brown. His Fu Manchu mustache was thinning at the edges to expose a mouth that always seemed to pucker with unmistakable wisdom, more purple these days than pink. His faded jeans, his tasseled leather jacket with iron-on patches, and his loafers all suggested a time when patriotism meant more than blind allegiance to country. We’d met a long, long time ago. Was it on the Marrakesh Express? Was it on wooden ships? Or was it at our house? In Ohio? With Guinevere? And sweet Judy blue eyes? And the lady of the island? I was younger than him of course, enough to make a difference in our experience, but he fed me on his dreams. We were helplessly hoping back then, for peace, for love, and some nebulous notion of justice. “Confusion,” he told me “has its price,” and I thought I understood. He took off to find the Southern Cross, leaving me to carry on without so much as a single bye-bye. I didn’t want to leave the anonymity of my little window onto Main Street, or the comfort of my air-conditioned booth beyond the crush of humanity, the steam from my latte warming my cold heart as it fogged the glass that separated me from that crush of Americana. But here he was again, in Everyone’s Hometown no less, taunting me with his sudden appearance. He’d had a heart of gold once, and now he was an old man. Then there was the small matter of that sign. I had to know what it said. I paid the waitress, a pretty little chipper with calculating eyes, and even tipped her extra for her kindness because that’s the way I’d become accustomed to taking my affirmation these days. No glory like Old Glory, they say, and she was everywhere when I stepped out onto Main Street. People were displaying the colors, whether by patriotism or convenience. The red, white, and blue was imprinted on every piece of cloth, on baseball caps, cowboy hats, and do-rags, on t-shirts and silk blouses, on leggings and patches sewn into the seat of worn out jeans, and it was even etched into the flesh of a great many arms and shoulders, necks and ankles that weren’t clothed. 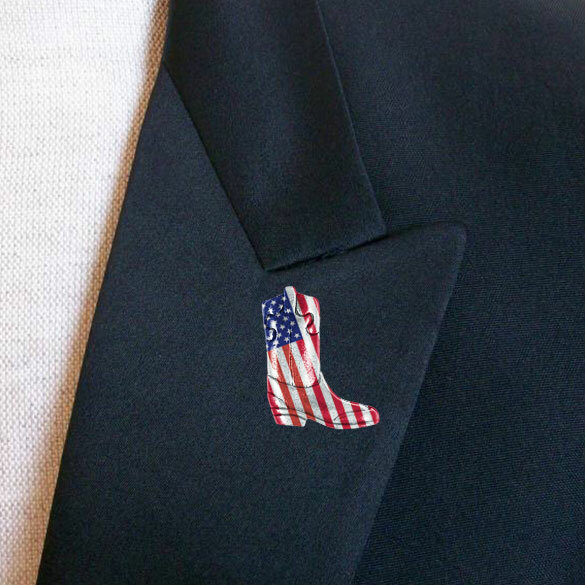 I was representing, of course, with a lapel pin of the flag in the shape of a cowboy boot attached to the pocket of my polo. I’d almost resisted the urge. A small part of me resented the imposition, but I was afraid someone might take offense. The strength of our country I’ve been told. “E Pluribus Unum,” out of many, one — except that the “many” part had become an illusion anymore. We were all old, white, and angry out there on Main Street at that moment. Somehow the inevitability of change and the threat to our carefully feathered nests had scared us. The hell with “E Pluribus Unum.” That was the problem, not the solution. We’d become enamored with “In God We Trust” and “One Nation Under God,” two slogans contrived much later in the Republic’s history to fend off another boogeyman not long ago. Shout the words “Obama” or “Allah,” or “immigrants” in a crowd of us and we’d turn into a vicious, screaming mob. Here we were in the middle of a war — another one started on false pretenses no less. The poor and working classes were struggling to keep up — still. Millions of our fellow citizens were getting locked up – for profit. Large swaths of the population were on the verge of disenfranchisement – again. And I couldn’t be bothered to lift a finger? I guess I’d just grown too tired. Or was it too comfortable? Or both? That was the reality of life in this country. It had become easy to say it’s somebody else’s problem. You were rewarded for saying it, by the media, by your employer, by your colleagues and neighbors, and even by your spiritual shepherds. I heard a man speaking across the street. He was standing upon a gazebo near center of the square, a megaphone in one hand. The crowd closed in around him when he began to utter those magic words, the ones intended to bring us together in pride and love of country on this all-American holiday. A cheer went up, and the man chuckled with irony. There were random shouts here and there, from the fallen angels – a polite description in a community that regarded them as traitors, and I could see necks in the crowd craning to identify the culprits. There was a murmur of assent among the cheers. A great shout went up, and the crowd packed in tighter in anticipation of those words that would ignite them into a spasm of jingoistic ecstasy. I used the moment to cross the street and sneak in behind the man, my friend, and peer over his shoulders, but he looked back as I approached, and held my gaze with his. He directed me to a position in front of him before allowing me to look down at his sign. That’s what it said, the sign. It was the kind of ambiguous statement, an accusation in the form of a question, that always set me on edge. He might have well been asking me when I stopped beating my dogs. I reached into my wallet to pull out a five note, then thought better of it after looking at him again and pulled out a twenty. “Strange way to ask for assistance,” I said, offering the bill to him. I knew it sounded defensive, as if it was his fault, but he smiled away my embarrassment. “What was our reply?” he asked. He hesitated as the man in the Gazebo could be heard something like “take our country back,” then he nodded almost in agreement. I wanted to ask him who has the time. Or what was I going do with my oversized houses and expensive cars? How could I afford to pay for them if I gave up my high-paying job for the cause? And what about the personal risks? The violence? The filth? The squalor? The inconvenience? There were a thousand and one reasons I couldn’t, and only one reason I could – because it is right. “You want to get by with token acts of compassion?” he asked. I heard the man in the Gazebo say “let’s bow our heads in prayer,” and my friend tilted his head in the direction of crowd. Mike Bates is a corporate attorney, recently retired to recover the purpose in his life. He lives with his wife and daughter in the high desert of Arizona. His fiction has appeared in Mobius, Copperfield, Scholars and Rogues, and The Fear of Monkeys. This entry was posted in Archive, Fiction, Original Lit, Recently Added. Bookmark the permalink.